Voting process in a number of polling stations in Cooch Behar was temporarily disrupted as EVM machines stopped working. 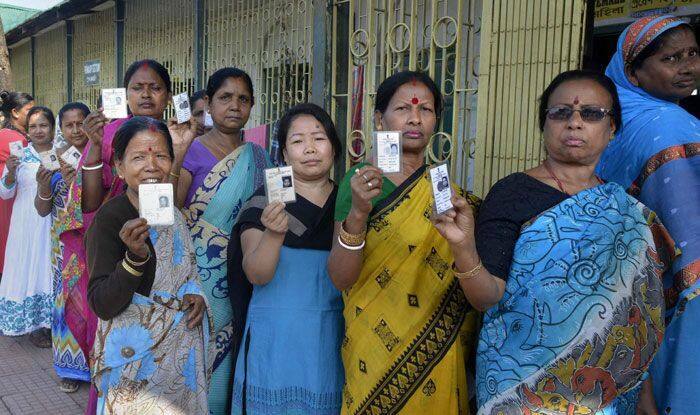 Amid sporadic incidents of violence, EVM glitches and allegations and counter-allegations of electoral malpractices, Cooch Behar and Alipurduar constituencies in West Bengal reported nearly 70 per cent polling till afternoon on Thursday as the Lok Sabha polls kicked off. Of the over 34 lakh voters in these constituencies, an average 69.94 per cent had polled till 3 p.m., an Election Commission official told IANS in Kolkata. While the polling percentage for Alipurduar was 71.44, Cooch Behar recorded 68.44, he said. Long queues could be seen in front of the booths in both the constituencies from well before polling began at 7 a.m.
“How can so many EVMs malfunction? We smell a conspiracy. I have tried to complain to the Election Commission but they are not reachable. So I have informed the District Magistrate,” he said. Trinamool and BJP workers clashed at Dinhata’s Rosmonda primary school booth, following allegations that the Trinamool workers were beating and driving away voters. “They even stopped somebody like me. It seems they have a design. In the border areas also, the BSF is interfering in the booths and disturbing the voters. BJP has indulged in violence in a number of areas,” he alleged. On the other hand, BJP’s Pramanik demanded a repoll in all the booths which were not manned by the central forces and alleged that the state police were not cooperating with the voters. “There were traces of unrest in Cooch Behar’s Dinhata. Police rushed to the spot but now voting is going on peacefully,” he said. The Trinamool, BJP, Congress and Left Front are in the fray in both the seats. Among the Left’s partners, the Revolutionary Socialist Party (RSP) is contesting Alipurduar, and the Forward Bloc is fighting in Cooch Behar.